Chris Sgro stepping down as Executive Director Equality N.C.
Chris Sgro, executive director of Equality North Carolina.advocacy group announced this morning its executive director, Chris Sgro, is stepping down after nearly four years.LGBTQ advocacy group announced this morning its executive director, Chris Sgro, is stepping down after nearly four years. 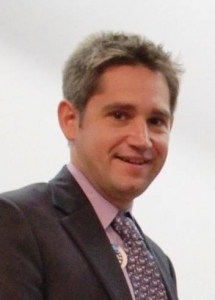 LGBTQ advocacy group Equality North Carolina announced this morning its executive director, Chris Sgro, is stepping down after nearly four years. Sgro is moving to Washington, D.C. to become Director of Communications with the Human Rights Campaign. Sgro became widely known as one of the faces of the struggle against HB2, even briefly serving in the N.C. House as the General Assembly’s only out gay member when he finished the term of late Rep. Ralph Johnson (D-Guilford). The group’s board of directors are beginning a national search for Sgro’s successor. Sgro’s announcement comes the same week Rev. William Barber, the nationally renowned leader of the NC NAACP, announced he would step down to begin a new national poor peoples’ campaign in the vein of Dr. Martin Luther King Jr.